Of the 12 films I've seen at Cannes, the most warmly cheered has been the South African "Life, Above All." That's possibly more significant than in other years. The audiences at Cannes this year have been oddly restrained, and there's less clapping at the names of directors; even Jean-Luc Godard received only perfunctory applause. Is this becoming less a directors' festival and more a trade fair? Perhaps I leap unfairly to conclusions. Some traditions remain. Before every screening at the Auditorium Debussy, for example, someone in the dark is sure to call out "Raoul!" There's laughter and a little buzz as old-timers explain to their neighbors that once in dim antiquity a moviegoer entered after the lights went down, was unable to find his friend, and shouted out "Raoul!" The search continues. Oliver Schmitz's "Life, Above All" has been the best heart-warmer and tear-jerker so far--and when I write from Cannes I use the term "tear-jerker" as a compliment, because this is a hardened crowd and when you hear snuffling in the dark you know it has been honestly earned. The film is about deep human emotions, evoked with sympathy and love. "Life, Above All" takes place entirely within a South African township, one with moderate prosperity and well-tended homes. It centers on the 12-year-old Chanda, who takes on the responsibility of holding her family together after her baby sister dies. Her mother is immobilized by grief, her father by drink, and a neighbor woman helps her care for two younger siblings. Suspicion spreads in the neighborhood that the real cause of the family's problems is AIDS, although the word itself isn't said aloud until well into the film. 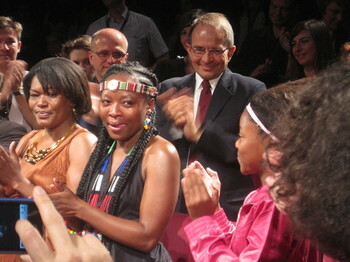 More plot details can await my review, but let me particularly praise the performances of young Khomotso Manyaka, in her first role as Chanda; Keaobaka Makanyane as her mother, and Tinah Mnumzana as the neighbor. The film's ending frightens the audience with a dire threat, and then finds an uplift that's unlikely enough in its details to qualify as magic realism. "Life, Above All" must be particularly effective in South Africa, where former president Thabo Mbeki persisted in puzzling denial about the causes and treatment of AIDS. This contributed to a climate of ignorance and mystery surrounding the disease, which in fact increased its spread. By directly dealing with the poisonous climate of rumor and gossip, the film takes a stand. But in nations where AIDS has been demystified, "Love, Above All" will play strongly as pure human drama, and of two women, one promptly and one belatedly, rising courageously to a challenge. I saw "Life, Above All" not long after posting a few comments critical of my previous blog entry about Jean-Luc Godard's new "Film: Socialisme." His film failed to impress or engage me, and seemed an obscure exercise in stylistic arrogance, with disdain for the audience. A critical comment by Jeremy Fassler was affectionate about his sometime hero, but Ezra Scalzo informed me: "There was a time when the critic had a duty to propel artists into new territory, which Godard has gone to despite your libel, and if we should be so lucky, he will continue to stimulate cinematic discussion in every way that your petty lifetime anecdotes, tawdry punk scripts and political ramblings do not." As I read this, I recalled writing similar things myself in the 1960s about the philistines who did not embrace Godard. I felt that way about his films made then, and I still do, but I believe he has grown needlessly obscure and difficult, and I ask: Who does he make movies for? Those who will extrapolate meanings from them? Those who will helpfully explain what we missed? Or people who go to a movie and would appreciate a fair chance of figuring out what the damned thing is about? 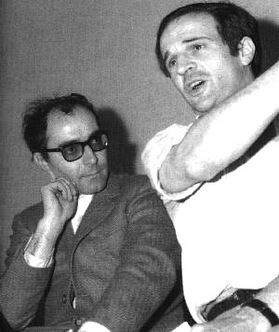 I assume anyone who goes to a Godard film is unlikely to be stupid--is likely, indeed, to know a great deal about film. But this hypothetical person, however well-meaning, is unlikely to extract anything comprehensible, moving or useful from "Film: Socialisme." It is a sterile exercise. Returning to the hotel three movies later (one of them was "Life, Above All"), I found Todd McCarthy's review of the Godard. He had a response similar to mine: "This is a film to which I had absolutely no reaction--it didn't provoke, amuse, stimulate, intrigue, infuriate or challenge me. What we have here is failure to communicate." McCarthy concludes: "Whereas Godard's one-time comrade-in-art-and-arms and subsequent favorite whipping boy Truffaut adhered to Jean Renoir's generosity of spirit, Godard has long since become the mean-minded anti-Renoir, someone who can say nothing good about anyone except himself. Like his film, it's not a worldview that says anything to me at this point." I feel much the same. Because Godard meant something years ago, because he had a towering presence and a considerable influence, we continue to see his films, for smaller and smaller rewards. I believe he has contempt for the mass of moviegoers. Truffaut once described the beautiful sight of walking to the front of a cinema and seeing all those eyes uplifted to the screen, sharing the director's dream. What are Godard's dreams? We cannot know, because he chooses not to share them. I don't have a problem with difficult films, those that are about themselves, those that challenge the audience. Consider a film like Charlie Kaufman's "Synecdoche, N.Y.," which is as Brechtian as Godard could possibly desire. Kaufman has something he desperately wants to say about the nature of life, and he says it in a complex way suited to his message. He wants to communicate, not to withhold. Thinking of these films, my choice is clear: I prefer those that want to tell me something, to feel empathy with its characters. I reject those that are sealed off and sadistically enigmatic. I'm sure Godardians will be able to provide an explanation of his film--indeed, many explanations, all different. But we will be reading what they bring to the film, not from it.